↑ p26, Barmé, Geremie R (2008). The Forbidden City. Harvard University Press. ↑ "Gùgōng" in a generic sense also refers to all former palaces, another prominent example being the former Imperial Palaces (Mukden Palace) in Shenyang; see Gugong (disambiguation). ↑ «闾丘露薇：星巴克怎么进的故宫？(Luqiu Luwei: How did Starbucks get into the Forbidden City)» (Chinese)։ People Net։ 2007-01-16։ Վերցված է 2007-07-25 ; see also the original blog post here  (in Chinese). 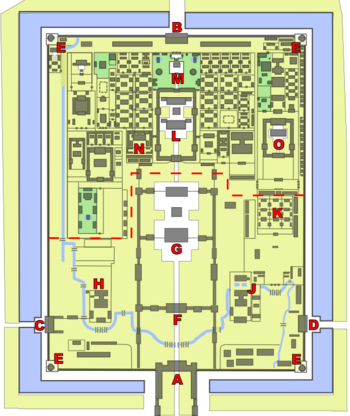 ↑ As larger buildings in traditional Chinese architecture are easily and regularly sub-divided into different configurations, the number of rooms in the Forbidden City is traditionally counted in terms of "bays" of rooms, with each bay being the space defined by four structural pillars.